7 Good Reasons Why You Should be Using Google Analytics Right Now! Google Analytics is an amazingly powerful tool that everyone has at their disposal. Even more amazing is the fact that this powerful tool comes completely free of charge. When used properly google analytics can be an amazing insight into the heart of your website and of how it’s performing. The metrics that google analytics use when gauged against their compiled data can be great indicators in wish to measure the success or lack thereof of your website in key areas such as number of users, bounce rate, page views, conversion rates etc..
As mentioned above google analytics is a completely free tool to use. It costs you nothing to use but if you don’t use it at all then it could cost you in terms of making mistakes that you could have corrected had you the knowledge gleaned from google analytics. Google Analytics automatically collects, compiles and organizes your data for you. You do not have to perform any action in order to get the data. Google Analytics simply does all the work for you. To get this data all that needs to be done on your end is to initially setup your Google Analytics account by copying a simple piece of code on your website. When applied this code enables Google Analytics to start collecting data from your website automatically and then to generate reports accordingly. The data from these reports will aid you when you decide and plan to implement strategies to increase the performance of your website. Google Analytics bounce rate is the percentage of traffic that leaves your website quickly after landing on it without looking at any other pages before they leave. Bounce Rate can be a useful barometer in which to gauge how effective or not your SEO is as bounce rate can indicate how accurate the page is targeted towards visitors who are interested in that type of content or indeed in your business and if a page has a high bounce rate it can usually be a signal that something is inherently wrong with that web page whether it’s the content or the design of the page that seems to be frustrating customers so much that they bounce. If your page has a high bounce rate and it’s a key page for you then it’s time for you to reevaluate the SEO on that page and possibly the design also to ensure you are delivering the best user experience possible. Google Analytics provides you with valuable data about your audience which will help you to understand which channels drive most of the traffic to your website. The Audience section provides a lot of information about the people who visit your website like their age, gender, interests, devices used and location. Social platforms are a great way to drive a lot of traffic to your website and to engage with potential customers. 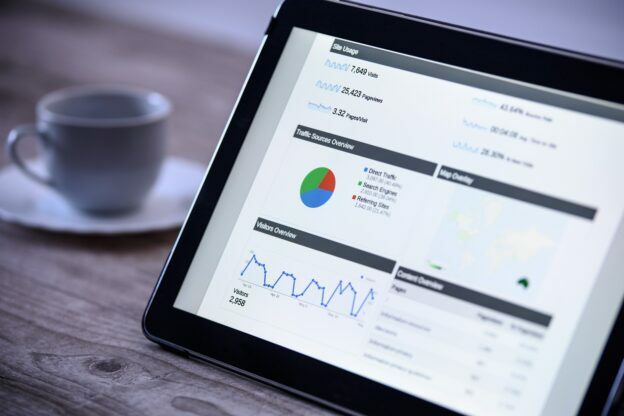 Google Analytics gives you the access to view what exactly catches the attention of the users and this data will inform you on where to place an ad accordingly. Through google analytics you can not only gauge how successful your social platforms that you use are performing but you can also check exactly how much conversions each social platform is giving you. Based on this data you will be able to dedicate the majority of your time and resources to the best performing social platform. Great written content is a brilliant way to attract new customers to your website and improve the user experience your website provides. This is commonly understood and is the reason why so many businesses have blogs, newsletters etc.. as these pieces of content can drive traffic towards your website and increase conversions. Google Analytics helps you to keep a track of all the content published that receives views and shares. Google Analytics then generates a breakdown of the page views each of your blog posts receive and this data helps you to understand which pieces of content are the best performing for you. Google Analytics allows you to set goals which track your website’s success in a certain area such as new users for example. You could set a goal that in the next month you wish to have 1000 new users and by viewing the data you can measure it against your goal to inform you if the current approach you are taking is going to result in you realising this goal or if in fact further strategizing is required. Google analytics is a brilliant tool to use to help you make your website more successful. The data it provides is invaluable and considering it’s free you have no excuse to justify not using it. If you aren’t using it currently you’re missing out! To find out more about google analytics and other strategies to improve your website contact 2Cubed today!